(Bloomberg) -- DowDuPont Inc. is set to separate into three different entities and the New Dow is valued at more than $40 billion by Morgan Stanley, which notes that the shares are likely "coiled up" for outperformance. Dow Holdings Inc. or the "New Dow" is set to debut trading on a "when-issued" basis on March 20, and regular trading on April 2. The analysts are working on how to value the companies. Morgan Stanley’s Vincent Andrews is valuing the new company at $53-$60 per share, implying a potential market-cap above $40 billion. Andrews is assigning an estimated Ebitda multiple of about 7 to 7.5 times for 2019, which is similar to what Bloomberg Intelligence analysts Richard Bourke and Jason Miner are assigning for the new company. They see the New Dow’s enterprise value around $61 billion, implying Ebitda multiple of about 7 times its 2019 estimates. Andrews notes that the New Dow could initially trade at a discount to his estimated price range, as it will need "a reasonably enticing discount" compared to peers to get shareholders interested. However, the stock could trade above his estimated range, if income oriented investors start gravitating toward New Dow’s attractive dividend yield. Viswanathan is assigning a weighted average multiple of about 7.6 times for New Dow, 11.9 times for New DuPont and 13 times for Corteva in 2019. He lowered estimates for all three companies for 2019-2020 to reflect the higher costs, but still maintains his top pick rating due to its attractive valuation. The New Dow will see a modest decline in its Ebitda this year, due to margin pressure for polyethylene, polyurethane and siloxane business. An improvement in the second half will be critical for the stock, as most peers are suggesting a possible revival in end-market growth at that time. The enterprise value for the New DuPont may be about $94 billion, implying a multiple of 11.3 times for 2019. 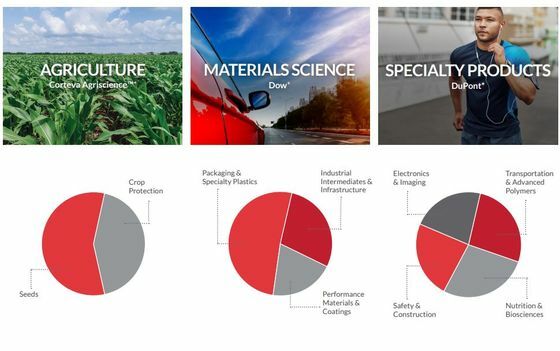 The New DuPont will become a key element in specialty chemicals M&A in 2019, once established as a stand-alone company. It is also possible that it will shed its Nutrition & Biosciences unit, which would remain an industry leader on its own.